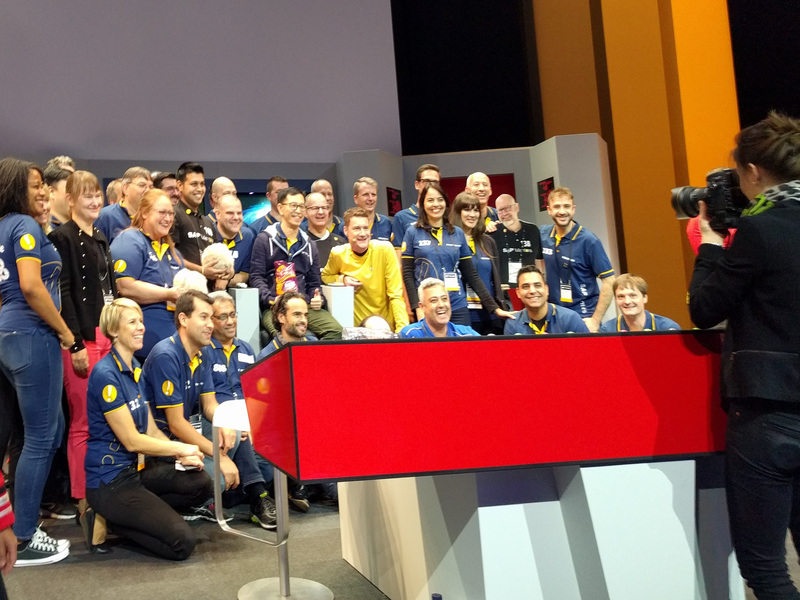 After a wonderful week in Barcelona I will share how I saw the SAP TechEd and what ideas came into my mind. I am one of the 10 speakers from the SAP community, I was therefore both speaker and attendee. This is the first time I was at a SAP TechEd. In the last years I attended and/or spoke at SAP Inside Tracks in Munich, Frankfurt, Hamburg, Hannover and Walldorf. I was also two times at the ESUG, the conference of the European Smalltalk Usergroup, the second time as speaker. I saw also a few dozen recordings of talks from other conferences in the internet, some of them influenced my work or the talks I give. I entered hall 6, where the keynote was given in Barcelona only a few minutes before start. The hall was very big and dark with beautiful light and full with people. For me this was a wonderful and emotional start of the conference. The real names of most presenters where not used during the keynote and I missed to look at the final credits. I would have preferred to hear or see their real names while they where speaking. I enjoyed the presentation so much that I even missed the little innuendo with the flat iron in Kirks hand. There is a closed speaker area where speakers can work with a stable internet connection. For me it was a wonderful place to relax and work on the slides. IT specialists sit very close. At the day of my talk, I was not able to go into the Internet with my laptop, but I planned to do just this in my demo. After a few minutes my problem was solved, it was caused by an activated flight mode that blocked the Internet. A whiteboard in the room displayed a list of activities planned for this day. I failed to recognize this, but one of the organizers read the content loud in front of all speakers. Thank you, I would have missed this information. I wanted to visit the room before to check that I can hold my presentation as planned. My impression is, that it was not supposed that speakers need time well before the talk to understand the room. This may be OK for experienced speakers who present only slides, but I had two demos prepared. I was told that I can visit my room at the first day of the conference before the keynote talk. But in the morning the area was closed. I decided to use a 30 minute break where the room was free. I was told to return later at the door, but insisted that I needed to prepare. These preparation was too short, I did not test the demos well enough. I planned to look at the presentation monitor during my demos. There are presentation monitors in the room, but none of them was close enough to my computer for me to read small text on them. I changed therefore the presentation mode in my computer. But I did not train my demos with this mode. The good point is, there was a technician in the room who helped me very fast when I had a problem due to this during my presentation. But I was irritated and to some extend distracted from my talk. Should there be a single dedicated person in such a big conference whose only duty is to support speakers to become accustomed with the room and the technical details? Especially for speakers like me, who speak for the first time at such a big conference. I met Andreas Gautsch in the speakers event Monday afternoon before the conference. Andreas is the second time in a row community speaker at the TechEd. This year he mounted his mobile phone on a robot. 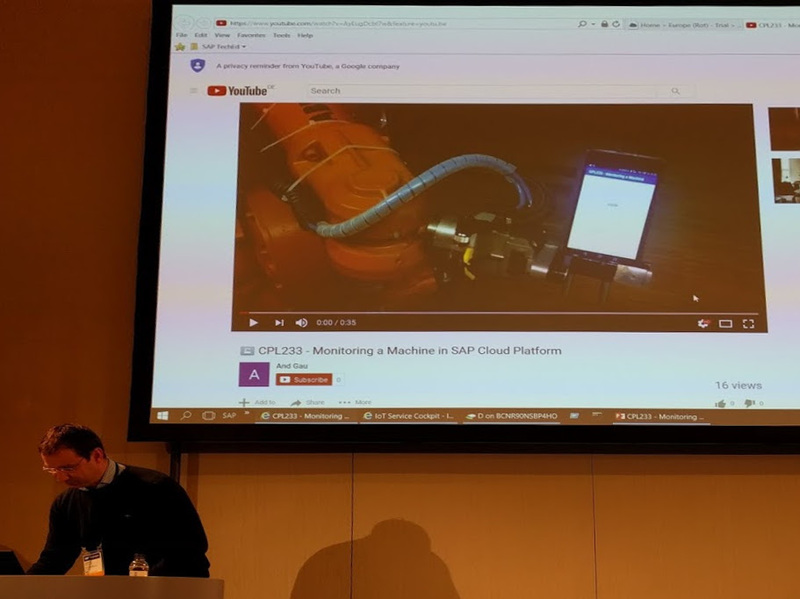 He uploaded the data of the acceleration sensor of the mobile phone to the SAP Cloud Platform and used the machine learning algorithms there to demonstrate a search for malfunctions of a production machine. I love to see the precious mobile mounted on the industrial robot. I wanted to attend also some non technical talks. So I joined the talk by Jamie Cantrell about how to use digital tools. I use Twitter and blogging now quite a lot, so I was curious to learn what Jamie has to say. I met Brian Dennett by chance the Sunday before the conference during dinner. So I decided to visit his innovation talk IT158 about Natural Language Processing. His talk took place in a small room with only a small group of participants. In my opinion it would have been better placed in the main room of the conference as understanding language with computers is a new and continuously improving area. I propose you search the internet for Natural Language Processing and Word2Vec to learn more. I spent a lot of my spare time during the conference at the SAP Mentors sitting area in Hall 8.1. Sometimes together, sometimes alone because all mentors where asked to pose for a group picture, like this taken after the key note. SAP Mentors tweed a lot, as I do. I read therefore very many tweeds during and after the TechEd that praised SAP Mentors. So much, that the famous advice for writers “Show, don’t tell” came into my mind. So I have to remind myself that without the work of many colleagues, I would not have been a the TechEd that year. Some are just active in the community, others are already promoted by SAP as Developer Hero or SAP Mentor. I love to hear talks by inspired speakers who are full of ideas they like to share. For me a great talk is clear and full of valid information. Such talks can be in small and in big rooms. A conference can have a single very big room where major talks are presented. If these talks are recorded and are publicly available later, this can be a good promotion for the presenters and the conference. At the end of the same week as the TechEd the Goto Berlin 2017 was held in Berlin. I did know already that Michael C. Feathers would be there to give a talk. 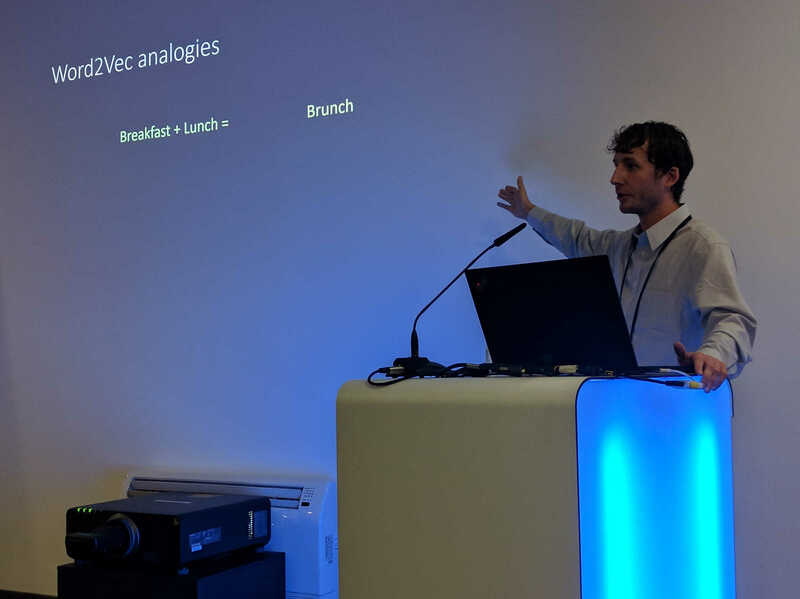 The whole Thursday I was tempted to cancel my flight home to Munich and fly to Berlin instead, just to attend a talk of one of the senior experts for testing and working with Legacy code. The session plan should be prominently displayed and with enough detail, so that I can determine what I want to see. Time on a conference is a precious good, the better we promote talks, the higher is the chance that attendees visit the talks that are right for them. I used the app to build the agenda of talks I wanted to hear. But I build my agenda only once, and I fear that I missed some talks due to this. I still like to see papers at a wall with the session schedule. Due to an error I received the information that I can also give two networking sessions. The second part of my talk is uncommon and I expected a need for explanations and questions. So I reserved the maximum of two networking session, I was told I could. Sadly it was an error, so these sessions had to be canceled. The TechEd is very big and it was very difficult to see even colleagues more than once. The probability to meet one of the speakers by chance is low. I attended my first conference at the end of my university career. As I was young and inexperienced, I gave no talk, but presented my work at a poster session. A poster session is the presentation of work in the form of a paper poster, there is typically also a dedicated time where the authors of the poster stand next to it to explain their work. Why not give people the option to apply for a poster session? This is much cheaper and easier compared to a talk. And a great opportunity to share ideas and meet people. If a certain room is reserved for a specific topic, people who are interested in this topic can just remain in the room. And have a high chance to meet colleagues with similar interests there. Everyone can apply as speaker at a SAP Inside Track. This constantly motivates me to attend and promote Inside Tracks. The second part of the talk I gave in Barcelona is for instance inspired by a talk Tudor Girba gave at the SAP Inside Track in Munich 2015. Tudor Girba is not working with SAP, but Damir Majer invited him to speak as he regarded his work to be relevant for us. Would it not be better if this talk would had been given at the SAP TechEd 2015? With much more people who could have seen it? Some of the well known speakers give also workshops. Is this possible on a TechEd? I searched the Internet for above words, but I found no such place. There could be a platform where the potential attendees of next year can enter wishes of what they would like to see or hear, even if they never attended a TechEd before. I would enter a lot of names there. I see now more and more videos of conference talks where the slides and the speaker are displayed next to each other in such a way that both are always shown and the slides are easy to read. The effort to make such videos is higher, but it is much more fun to watch them. So at least for talks by keynote speakers, I would like if this is regularly done. In my impression this becomes now standard for big conferences. I love all the suggestions and agree with them. This year was an interesting time for me to speak at Teched in Las Vegas. I had 15 minutes from my one speech to the next one. The rooms were fairly close – and I didn’t title my session correctly so I missed with some of the audience. I love spiking at Teched and would be interested in some of these changes. Open speeches up to some more “outside” SAP people would be nice. I love to go to those sessions, because the person is usually using the stuff I have. Not the technology of the future. However, the right mix has to be there. I do want to see the future technology. I know some people go to Teched only for that reason. Thanks very much for your comments, ideas, and careful consideration. 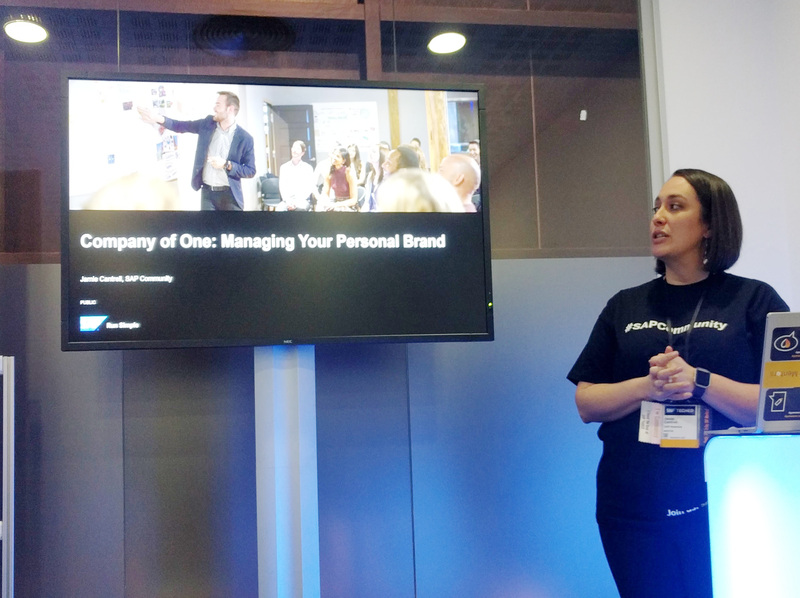 We at SAP TechEd try very hard every day, and every year to keep the conference as relevant and valuable as possible for all of our attendees. It is good to hear you enjoyed not only attending, but speaking at the event. I have shared your feedback with the content development and speaker management teams. Very soon we will begin the process of designing SAP TechEd for 2018 and your feedback will be considered during that process. Keep an eye out in the months ahead. it is much easier to desire something (as I did), than to make it happen. Thank you very much for your feedback. I wish you and your colleagues a successful SAP TechED year 2018! A good idea may be to give a shirt for every person who attended. I wear often the shirts I got from the European Smalltalk User Group Conference. I use them often, to show that I think, that Smalltalk is good, sometimes people see this and we speak about the conference. So I will probably join for one or two days, to meet the people again, and … to have a third shirt.